A Bit of Sass: Holiday Gift Guide: Cool Tech Gifts for Men! Gadgets and gizmos and bits and bobs, holiday season is the perfect time gift your guy with the latest and greatest technology. 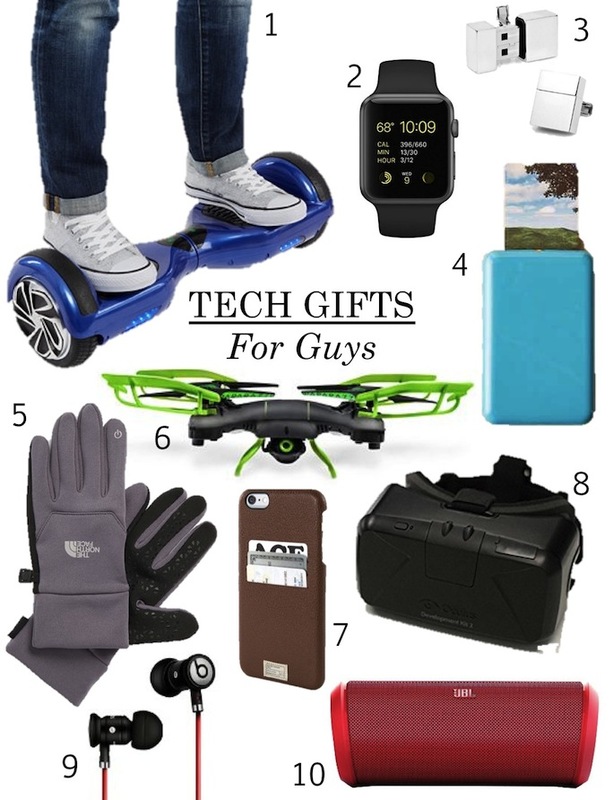 Whether you are looking for a stocking stuffer such as an iPhone case or a big ticket item such as hover board, for men who like to stay up one step ahead, tech gifts are the way to go. 1. IMOTO HOVER BOARD: Looking for a great tech gift for guys? Look no further than a hover board! It combines athleticism, technology and fun in one sleek package. 3. USB CUFFLINKS: For the sophisticated techie, brilliant businessman and James Bond in training, USB cuff links make a functional and fashionable gift. 5. THE NORTH FACE TECH GLOVES: Because what's the point of keeping him warm if he can't text you back, damn it?! 6. PAPARRAZI DRONE: Flying drones are a fun tech toy gift for men of all ages! For those more advanced gift a mini camera drone and for big spenders check out this flying drone. 7. IPHONE 6 WALLET CASE: For the man whose head is lost in code, gift a smartphone wallet case so that he only has one thing to forget;). 8. OCULUS RIFT VIRTUAL REALITY HEADSET: When I walked in one evening and saw my husband at our dining room table with an Oculus mask on I didn't know whether to laugh or run. Regardless, for tech toy lovers young and old, the Oculus is a win! If you're on a budget check out this other Virtual Reality Headset. 9. BEATS BY DRE EARBUDS: For guys who like their music, give the gift of some luxury earbuds so he rock out at work in comfort. If the man your shopping for is more of an over-the-ear kinda guy, these wood headphones offer as big of a fashion statement as they do sound. 10. JBL WIRELESS BLUETOOTH SPEAKER: Give the party guy in your life a gift he can enjoy at home and on the go, a portable wireless bluetooth speaker! Check out more Holiday Gift Guide HERE!